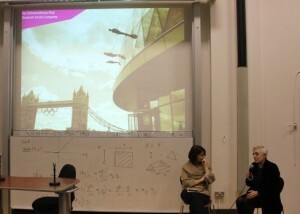 Polis Intern Emma Rees reports on the latest Polis Media Agenda Talk by Ruth Mackenzie, the director of the London2012 Cultural Olympiad – she asked what has art got to do with sport? You can listen to the podcast here. For the London2012 Cultural Olympiad artists were commissioned to create installations in various locations throughout the UK. They were free and accessible to all in an effort to draw art away from its traditional associations with high culture and high expense. Benjamin Brittan’s Noah’s Fludde opera was performed at Belfast Zoo, a 73 mile long piece of digital art was installed along Hadrian’s’ Wall and a ring of fire constructed at Stonehenge. Natural landmarks and public spaces were used to reinforce the sense of accessibility of art as something that everyone and anyone can both watch and participate in. Cultural Olympiad director Mackenzie outlined concrete examples of free art working in practice, with the success of the free museums policy introduced by the previous Labour Government. She emphasised the importance of free access to art in the context of a recession, warning against excluding young people in particular from art and sport and so curtailing their talent. Mackenzie warned of the cost to future creative culture developing if young people are not given the opportunity to participate in art during their early formative years in education. She linked this to British Education minister Michael Gove’s plans to marginalize art in the national curriculum, which she said will serve to starve our creative industries of future artistic individuals to the detriment of richness of the creative industries in the UK, so celebrated and showcased during the cultural events of the summer. For Mackenzie creativity is shown was the driving force for all the artistic installations, events and productions as risks were taken with unknown artists and art was liberated from its place in traditional venues and spaces. Incredible events were staged in unusual places as Stockhausen’s previously un-performable five and a half hour opera Mittwoch aus Litcht was performed in a factory with a camel and the ‘pop up’ event ‘Piccadilly Circus Circus’ saw the famous London landmark transformed into a real-life circus with feathers dropped from above and traffic stopped as part of the ‘One Extraordinary Day’ event. With locations revealed the day before for ‘pop up’ events and only small snippets of teaser information provided in advance, the project created a sense of a game and play with the audience that fits in nicely with the broader sporting theme. The project used the sporting summer of playing to play with audiences and participants and allow them to experience something extraordinary and very much ‘Once in a Lifetime’. The challenge is then to covert the ’Once in a Lifetime’ of summer 2012 in London into some kind of lasting legacy. 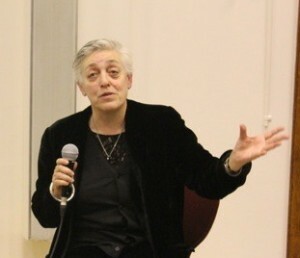 Even though Mackenzie expressed her dislike for the ‘L-word’ word, surely we have to ask how far the partnerships and ingenuity that made the Festival possible can be reproduced in the form of future festivals and cultural events. Government policy may hold the key as well as the ability to think more creatively about art and investment in creative individuals during tough economic times. In light of the current climate we must look at new and innovative models for culture, which must always start and end with the ideas of brilliant artists.